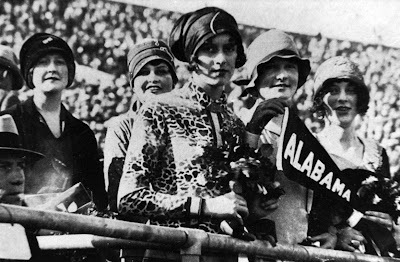 The sponsors of the Alabama Crimson Tide at the 1927 Rose Bowl game who traveled to California on the train with the team. From left to right: Mrs. Almetie M. Grimes (wife of C.B Grimes, owner of The Bama theater), Miss Elinor Williams, Mrs. Cornelia "Connie" Brown (wife of former player Johnny Mack Brown), Miss Louise Fargason (the fiancée of player Hoyt Winslett) and the wife of player Gordon "Sherlock" Holmes. 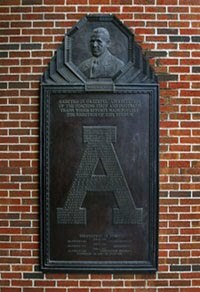 Alabama tied Stanford 7-7.